We have several ways for you to connect with information, contacts and services that can help you deliver the goods. From Social Media outlets, to Newsletters and Magazines. Be sure to get all the latest news and information from Nebraska Trucking Association. Get Nebraska road construction alerts and information on hot topics in trucking by following the Nebraska Trucking Association on Facebook and @nebraskatrucker on Twitter. On LinkedIn? Get invited to Nebraska Trucking Association’s private group for discussions on industry issues. Get trucking’s weekly headline news in the Good to Know Newsletter. Want the Good To Know Newsletter sent directly to your email? Just fill out the form to your left and start receiving weekly updates form the Nebraska Trucking Association! The Good to Know Newsletter also has Ad Space available for vendors to get the word out about good deals. Click Here for More information on Ad Space. 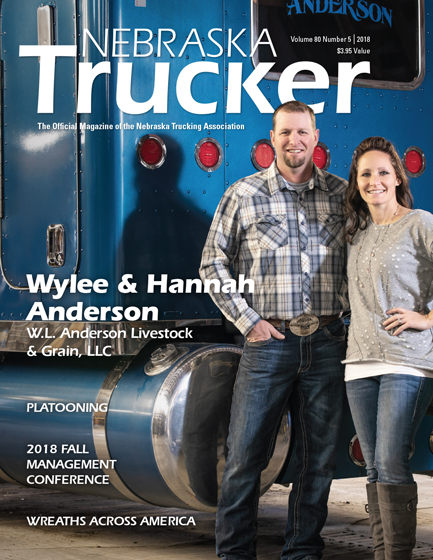 Meet your peers through the pages of Nebraska Trucker, a magazine that connects you to Nebraska trucking executives and their back stories. Nebraska Trucker is now up to 6,600 readers! The magazine also has ad space available. Contact Jennifer Matthews Kidd for details, 501-907-6776.